If you watch any of my tutorials on YouTube, you know I love a dramatic lash. Slightly clumpy and very black is how I prefer my mascara formulas. Not a spidery gross clump (but I guess that is up to everyone's interpretation), but definitely some drama. I have been testing out three new formulas and found that all of them were right up my slightly clumpy/dark color/dramatic alley. 1. It Cosmetics Superhero Mascara - I believe the first time I ever tried this was on camera during one of my tutorials and I was immediately stunned by how gorgeous the formula went on. The brush is the least spiky of all three but it goes on quite thick from first swipe and builds up quickly. My below images are 2-3 coats of each, though I was surprised at how the Superhero mascara came out on camera. Because in person, I find it to be much more dramatic and beautiful. In the swatches, it came out a bit meh which I apologize for. But if you watch any of my recent tutorials, I use it in many of them. What sold me even more was there were no bits left on my brow and almost no smudging. The brush is also the easiest to maneuver and allows me to get even the smallest lash because of the narrow end. This will definitely be a repurchase for me when I run out. 2. 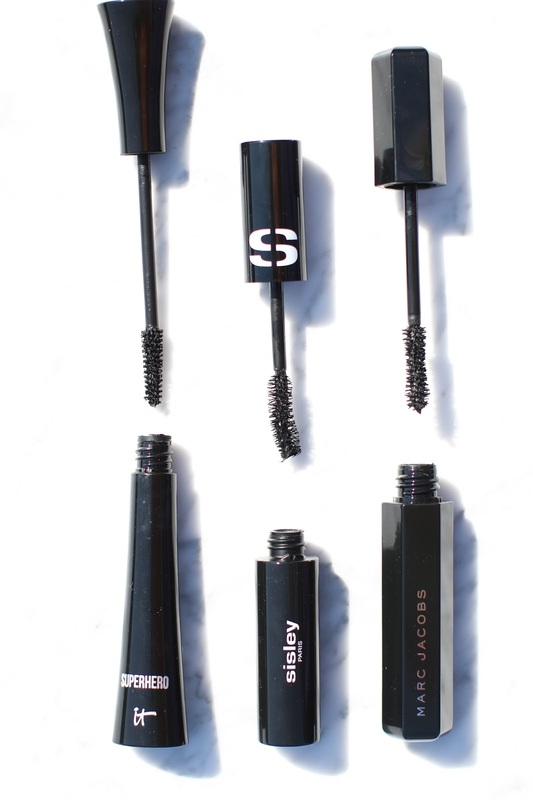 Marc Jacobs Velvet Noir Mascara - This is the newest mascara launch from Marc Jacobs and all I heard was rave reviews. So like the beauty sheep I am, I had to buy it and see for myself. I immediately liked the look of the brush and knew it would give me a beautifully separated lash, which it did. The formula is inky black, though not as dramatic as the It Cosmetics. I even let it dry a bit and tried adding a few more coats to get it to bulk up a bit, but it never quite reached the level of clumpiness that I prefer. However, I loved the long, separated and flirty lashes it gives me so I reach for it quite often. The only downside is that it leaves bits on my brow bone within an hour of applying. I would not choose this for when I need my makeup to last all day, rather a few hours or an evening out is a better choice for this formula. 3. 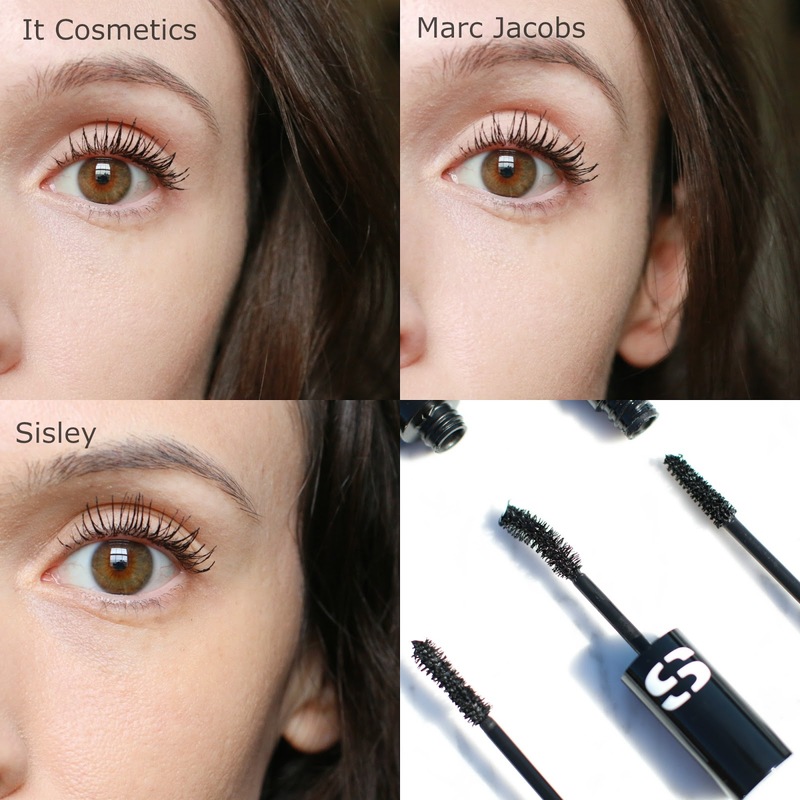 Sisley So Curl Mascara - The original Sisley So Intense mascara is one of my all time faves (and has the oddest brush/comb ever so it takes some getting used to), so naturally I needed to try the new curling formula. 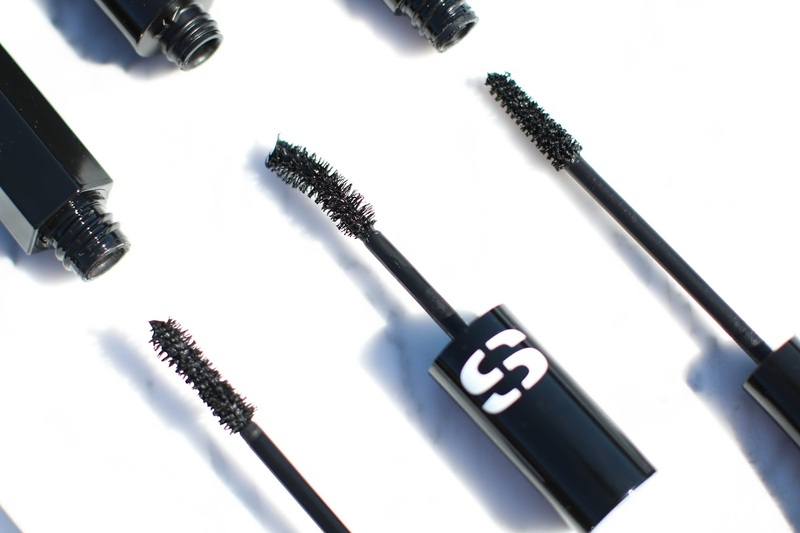 The brush is much closer to a standard mascara brush than the So Intense and has a small curve to it, hence the "curling" claims. 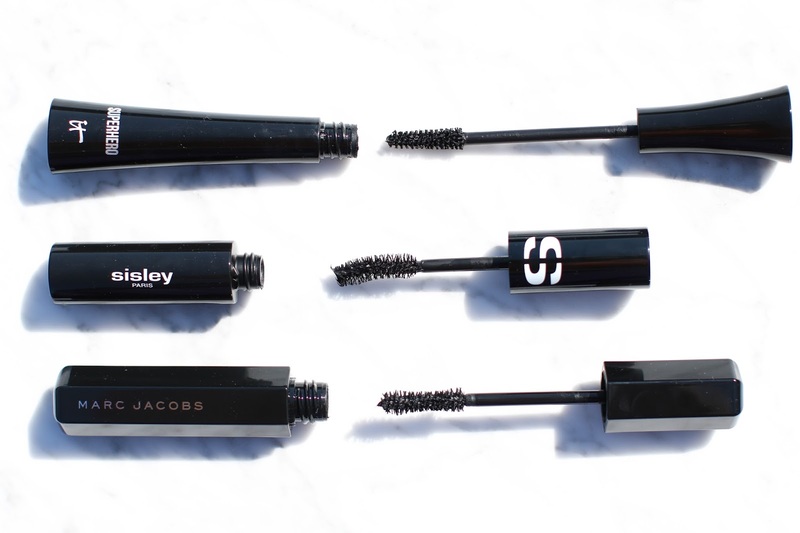 The formula managed to combine the best of the two previous mascaras into one. It builds up quickly to give the lashes some drama, separates them nicely and gives them nice length and a curl. There were no bits left on my brow bone and no smudging which made it great for all day wear. I didn't think I could enjoy a Sisley mascara formula more than the So Intense, but they managed to make one that rivals it. I love the mascara from IT Cosmetics from B-Glowing it is one of the few that doesn't clump my lashes together.